The Institute of Chartered Accountants of Bangladesh (ICAB), the first founding member of South Asian Federation of Accountants (SAFA) in Bangladesh observed the International Accountancy Education Day 2017, first of its kind in the country Friday. A rally was brought out by leading members of ICAB. Representatives from different CA firms, public and private universities attended the event to commemorate the day. 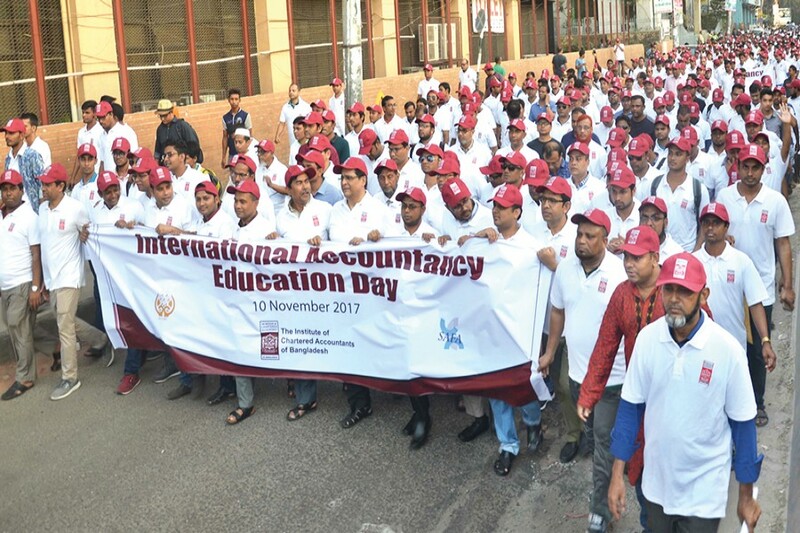 The Institute of Chartered Accountants of Bangladesh (ICAB), the first founding member of South Asian Federation of Accountants (SAFA) in Bangladesh observed the International Accountancy Education Day 2017, first of its kind in the country Friday. A rally was brought out by leading members of ICAB. Representatives from different CA firms, public and private universities attended the event to commemorate the day. The International Accountancy Education Day is being observed across the globe on the 10th of November. November 10, happens to bear great significance for the accountancy community. Italian Mathematician and Franciscan friar, Luca Bartolomeo de Pacioli authored a book titled "Summa de Arithmetica Geometria Proportioni et Propotionalita" (Everything about Arithmetic, Geometry and Proportion) which was published in Venice on November 10, 1494, said a statement. First of its kind, the book summarized the mathematical knowledge of that time. It is considered to be the first printed essay on double entry bookkeeping called "Method of Venice" and was a basic source of some seminal works on mercantile accounting. The SAFA President, Mr. ASM Nayem FCA, ICAB Acting President Mr. Mostafa Kamal FCA, the Chairman of Dhaka Regional Committee- ICAB Mr. Muhammad Aminul Hoque FCA and SAFA Executive Secretary Mahbub Ahmed Siddique, FCA led the rally from Hatirjheel and ended at CA Bhaban in Karwan Bazar in the city.